Block 13 is a pinwheel design called Scrap Stars by Corey Yoda, I’ve not done a star shaped block before so I was really pleased with how well this one came out, I even managed to get my center nice and neat! 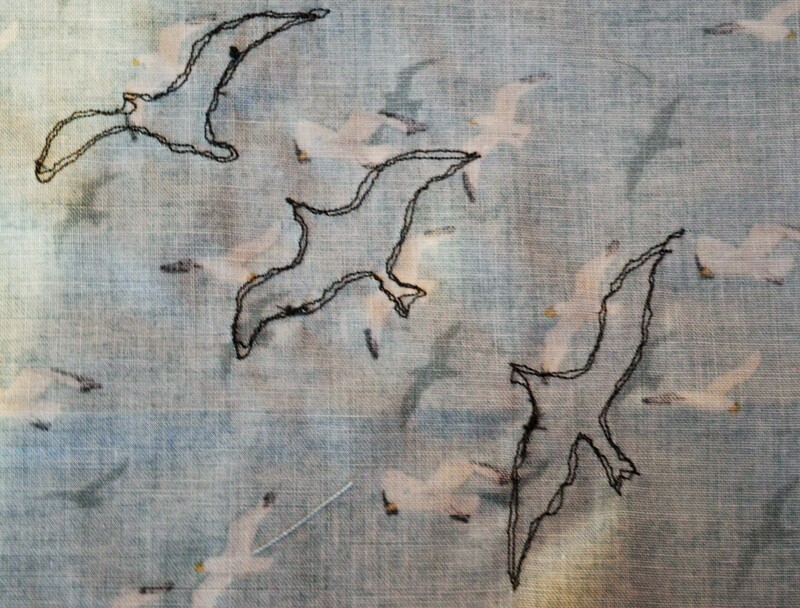 Block 14 is called Flying High, it was designed by Janet Clare and it is three appliqued seagulls. Now until I started this project I hadn’t done any applique on quilts, I’ve done a bit of needle-turn applique for earlier blocks, but I felt this was too fiddly for that. I decided to have a go at the ‘machine drawing’ technique, it’s a bit like hand-drawing round the shape with the sewing machine, it also means the stitching doesn’t have to be quite so perfect! I’m fairly pleased with this block, I deliberately used a coordinating thread, rather than a contrast, just in case it didn’t work out! The back view actually shows the stitching better. Block 15 was terrifying!! I put it off for several days, trying to pluck up the courage!! 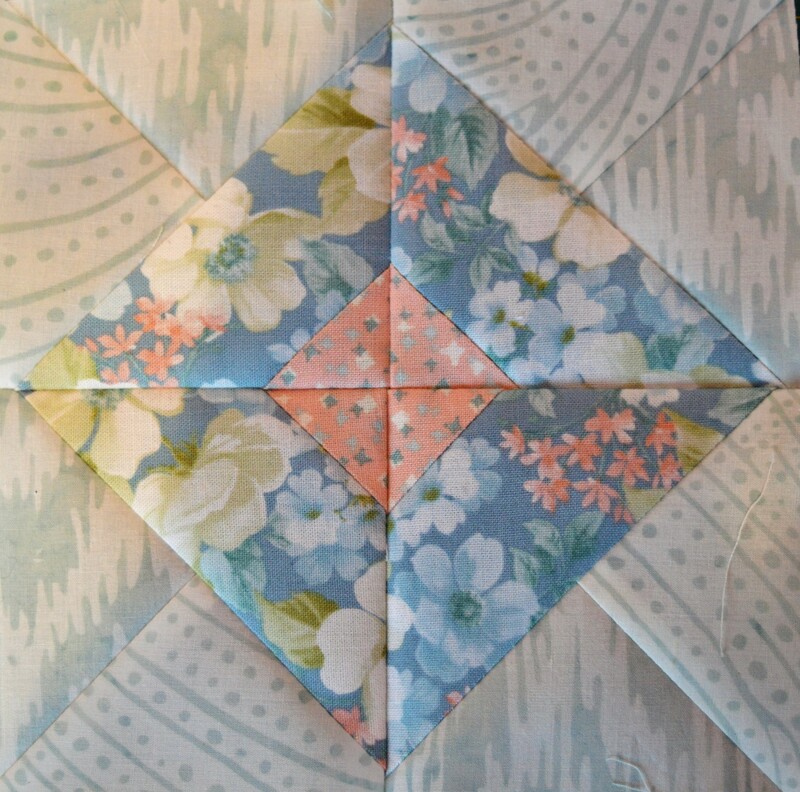 It’s called Family Affair and it’s made by foundation paper piecing. I never even heard of foundation paper piecing, let alone tried it. I read the instructions… re-read the instructions…watched the tutorial…it may as well have been in double dutch as I just couldn’t understand the process! After a couple of days of panic, I watched a tutorial by Alyssa Thomas of Penguin & Fish, she was making the actual block on line and showing us how to do it. It all suddenly clicked! It was a bit of a Eureka! moment…With foundation paper piecing the design is printed on paper and you position the fabric behind and stitch on the actual paper lines, apparently it’s a good way of achieving really sharp, narrow points. You don’t remove the paper until the end. I took a deep breath and started my block. It did take a lot of concentration to make sure my fabrics were the right way round and big enough to cover the area. I made one section first to get the idea and hopefully make my mistakes on (that didn’t work, I still made them!) and then made the other seven like a production line. It took far longer than it should have done to realise that as four blocks were mirror images of the others, the scraps of fabric needed to be the other way round too!! I did it! I felt like doing a happy dance!! It wasn’t half as bad as I thought, can’t say I’ll be rushing off to make a quilt like that, but at least I know the process now. My block isn’t perfect, but I’m proud of it! Thursdays block, Pieces of Friendship by Lindsey Mayland, looked simple in contrast..deceptively so! It was one of those where it’s an easy block, but not so simple to get perfect, my seams don’t match as well as I would like, but they’re staying! 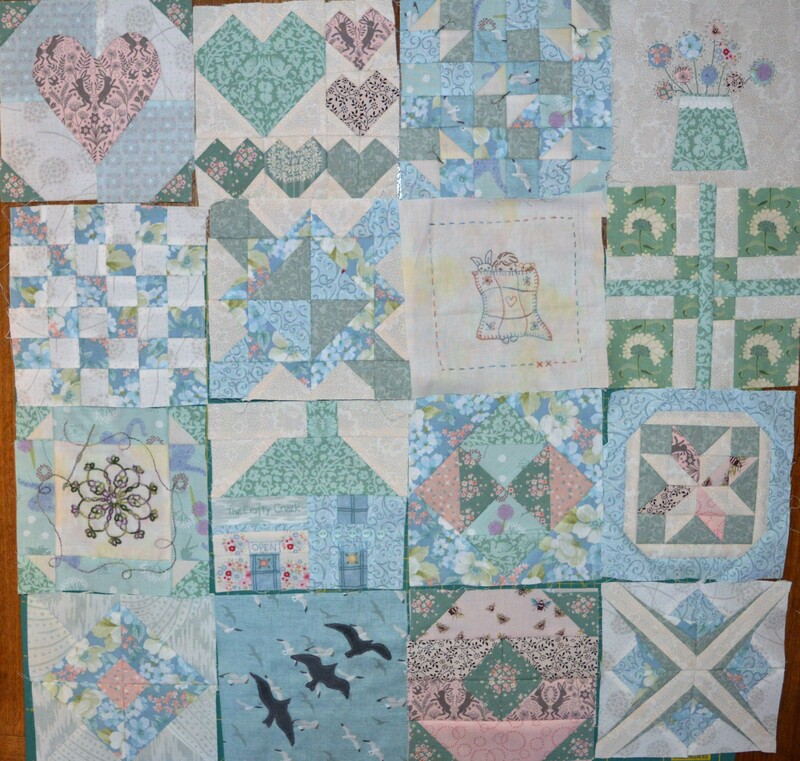 Splendid Sampler Blocks so far! Well done, you, especially with Block 15!! I am absolutely no good at paper piecing and admire those of you who are successful with it. Your blocks are beautiful. I am only making the traditionally pieced blocks, but making two copies of each. That way I hope to have a good size quilt when it is complete. Yes, I am a little intimidated by the 1-1/4″ pieces in today’s block, but I’ll save it for a day when I am feeling up to it. All my others are finished and quickly adding up to a very satisfying pile. I really like your color choices. 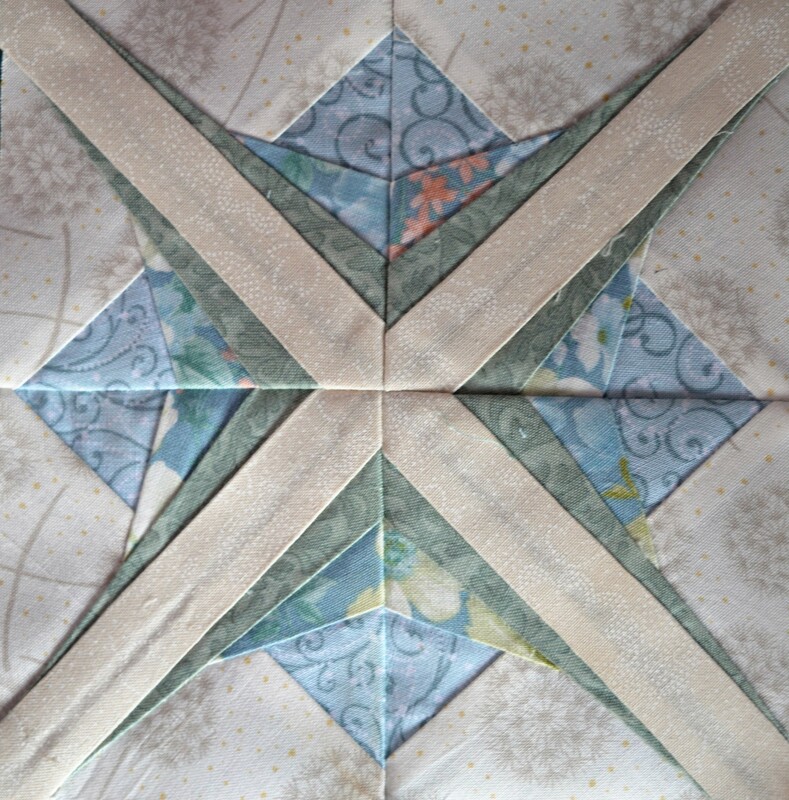 Thank you for the references to paper piecing… not that I’m ever likely to try it, but had forgotten what it was. Your squares are awe-inspiring to my non-quilting eyes. Cannot imagine what you’re working on now… it would give me nightmares!